In a climate of fierce economic competition and due to the increasing demand for healthier convenience food & beverage products, food flavors and colors manufacturers should do their best to preserve or even increase their margins, while increasing their market share by putting new natural products on the market. Current thermal evaporation methods result in degradation of the natural sensory profile of the natural extracts and juices. evapEOs is the ideal innovative solution for the cold concentration of natural flavor extracts, with reduced production costs. Coffee concentration experiments with the evapEOs process were carried out in the laboratory and the concentrates were compared with thermal evaporation. 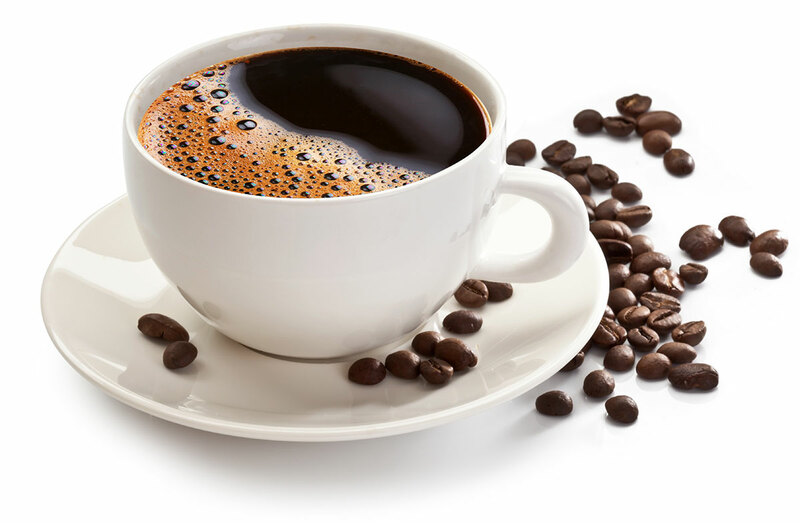 Analytical measurements of the coffee flavor compounds were performed on both concentrates and compared to the initial extract. 85% of coffee flavor compounds were preserved with evapEOs vs. 35% with thermal evaporation. Bergamot is a citrus fruit, well known for its unique intense aroma and flavor. The juice extracted from the fruit was concentrated from 12°Brix to 60°Brix using evapEOs Forward Osmosis at 20°C (70°F) and vacuum evaporation at 60°C (140°F). 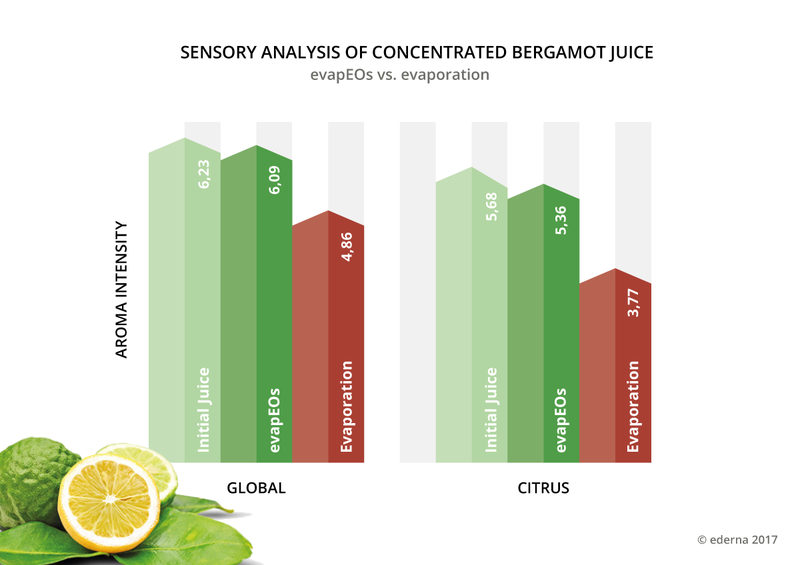 Olfactory tones of both concentrates diluted down to the initial concentration were evaluated by a panel of professional tasters from a French independent, COFRAC certified, sensory analysis laboratory: the olfactory profile of the concentrate from evapEOs is not significantly different from the initial bergamot juice, contrary to thermal evaporation. More info here. Strawberry flavor, easily identifiable, is complex as the characteristic aroma of a fresh strawberry is the result of numerous different aroma compounds. The juice extracted from the fruit was concentrated from 9°Brix to 60°Brix using evapEOs Forward Osmosis at 20°C (70°F) and vacuum evaporation at 60°C (140°F). 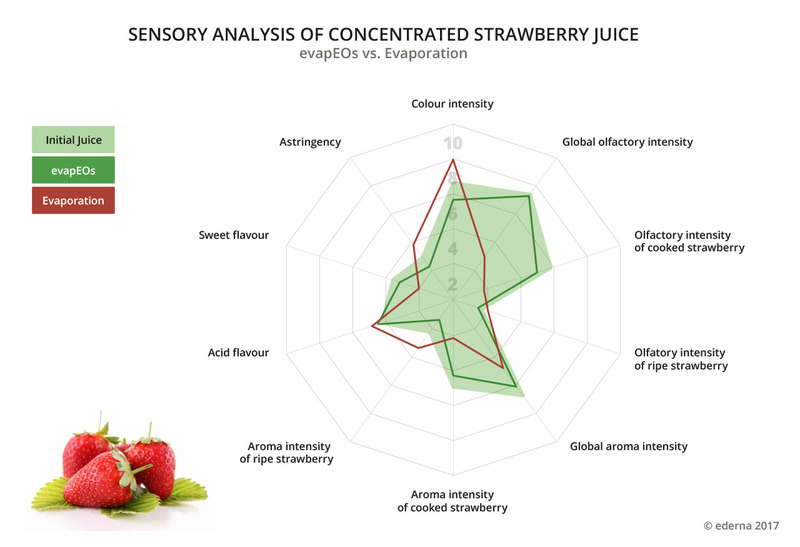 The sensory profiles of both concentrates diluted down to the initial concentration were evaluated by a panel of professional tasters from a French independent, COFRAC certified, sensory analysis laboratory: the sensory profile of the concentrate produced using evapEOs is very close to that of the initial strawberry juice, contrary to the result achieved by standard concentration for which global olfactory and aroma intensities were significantly degraded by the thermal treatment. More info here. Consumers are turning towards healthier food and drink options to cut down on alcohol intake thus non-alcoholic beer is becoming a trend, gaining traction on a global level. 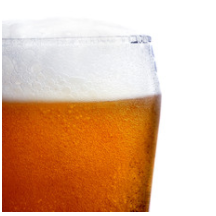 evapEOs is the ideal innovative solution for the dealcoholization of beer while preserving the real taste.